Our white pyramid 6x6 post caps serve multiple functions. They protect your wooden fence, which is an expensive investment in and of itself. They also add a decorative element to an otherwise ordinary fence or deck railing. Our ASA resin post caps are made in the USA from the same hard plastic material automobile and marine vehicle manufacturing companies use. Its strength, durability, impact, and UV resistance make it the ideal material from which to make post caps. 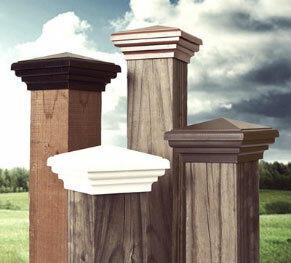 We guarantee these 6x6 fence post caps for ten years against fading, discoloring, and warping. ASA resin is an ideal material for fence post caps because it will withstand any severe weather scenario. It will also protect the tops of the posts from getting saturated with water and absorbing moisture. Excessive wetness can cause wood to develop mold and rot. Humidity fluctuations cause wood to contract and expand. Over time, the repetitive cycle of shrinking and expansion weakens the wood. The white pyramid 6x6 post caps come in two versions: Nominal and Actual (also called True.) Nominal post caps fit a standard post whose measurements are roughly ½ an inch smaller than the advertised or tag size that is indicated on the shelf and the posts. Our nominal 6x6 fence post caps fit posts whose dimensions measure from 5.5” x 5.5” to 5.75” x 5.75.” Actual post caps will fit posts whose true measurements range from 6” x 6” to 6.25” x 6.25.” Our white pyramid 6x6 post caps from the Estate Series slide down the post so that they cover the post and the sides for 1 ½ inches from the top. The widest point of 6x6 fence post caps is 7.5 inches. Our revolutionary and patented SNAP-CAP installation method gives us the only patented post caps on the market. The SNAP-CAP consists of two pieces. The installation process is so easy that you’ll have your 6x6 fence post caps on the posts in no time. And the screws are never visible. Our post caps cost far less than comparable wooden post toppers. Two added benefits include the fact that they last longer, and never require any maintenance.